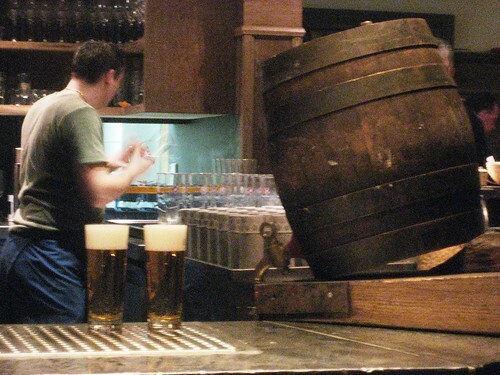 Beer from wooden keg, der Pshorr, Munich, from my flickr Munich photos. Monocle recently ranked Munich the world’s most livable city. I love Munich and I think that the Monocle video presents a very nice view of the city. I was particularly struck by the comments from BMW’s head of design, Adrian van Hooydonk. In the video he says Munich doesn’t take energy from you (the way living in many cities does) but gives you energy (about 3 minutes into the video). I remember thinking something similar when I first visited in the 1980s … waiting for the U-Bahn, which was clean, fast and reliable as clockwork, I thought how nice it must be not to have to worry about public transport … a real difference from most big cities. This frees up energy for creativity. My only complaint about the Monocle video is that it did not mention beer, and, for me at least, the beer in Munich tastes better than anywhere in the world. My posts and recommendations for Munich.